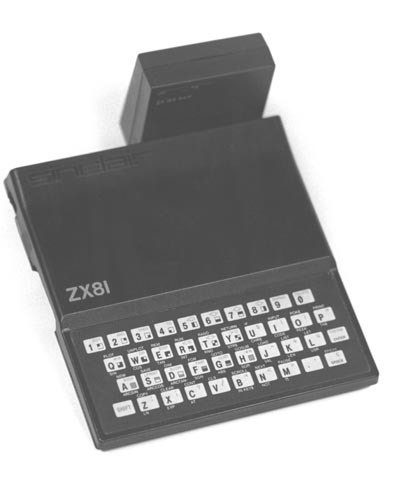 Black and white image of Sinclair ZX81. Shown is the computer with enclosed keyboard to the rear is a small box with 2K x 16K RAM label. Description: This had on 5 chips including the ROM, Microprocessor, two 512 byte RAM's and the uncommitted Logic Array (ULA). The ULA performed all the functions not carried out by the processor, RAM or ROM, earning it the nickname "dogsbody". THe ROM had a floating Point Basic and could maintain a display on the screen while the processor was performing another task. This made animation possible."